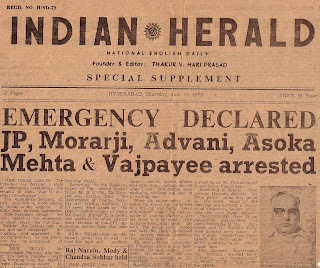 During June 1975, a state of emergency was declared by the then Indian Prime Minister Indira Gandhi. 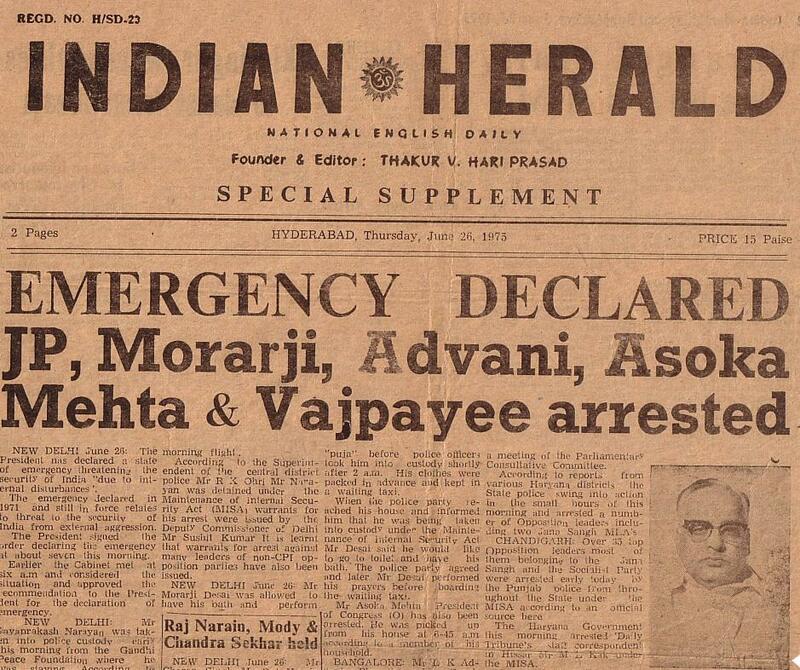 During the 21 months emergency lot of excesses were held in India by the Government officials. Many opposition leaders were put in prison and press censorship was imposed. In the general elections held in March 1977, Janatha Party returned to power under the mentorship of Lok Nayak Jayaprakash Narayanan. Congress lead by Indira Gandhi got washed out in the north. Even Indira Gandhi got defeated in the elections. In the Indian history, it is considered as the second freedom struggle. After March 1977, when Morarji Desai Government took charge, they constituted a commission under the chairmanship of Justice J C Shah, former Chief Justice of India. This Shah commission submitted its report in August 1978 on the various excesses committed during the 21 month dark days of emergency. The findings were startling. When Indira Gandhi came back to power in 1980, all the copies of Shah commission report were withdrawn from all the libraries and buried without even an epitaph Till now, it is reported that only one copy is available at National library of Australia. Even after three decades, no efforts were made to restore the report to fill the gap in the Indian political history. Mr Era Sezhiyan, 87 year old celebrated Parliamentarian, who was also one of the victims of emergency days, has brought out the Shah Commission report with his comments and remarks, under the title ‘Shah Commission Report – Lost and regained”. This book was released in Chennai by the opposition leader Mr L K Advani on 19th Deember 2010. Mr Era sezhiyan has a wonderful library in his house with more than six thousand books. He keeps the parliamentary proceedings and important reports from 1965 onwards till date. He is able to bring out the original Shah Commission report from the original copy he had with him in his library. I interviewed him in his library on his latest contribution to the political history. Please listen to his exclusive interview by clicking 'play' button.